Errors in the alignment of connected shafts are, generally speaking, unavoidable. Even when exceptionally favourable conditions do permit of perfect alignment in the beginning, working loads must eventually cause misalignment. Wear of bearings and vibration are two certain factors which contribute to throwing connected shafts out of true, and even changes of temperature may vary alignments. 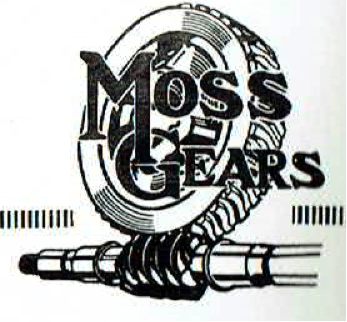 MOSS GEARED COUPLINGS will be found to be the perfect solution to this problem of retaining efficient operation. 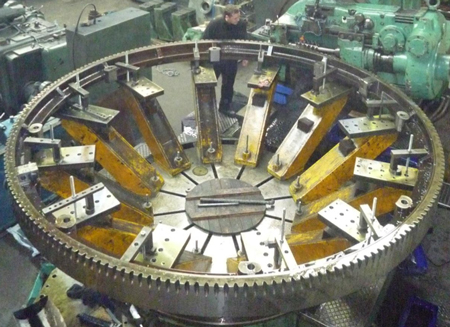 Intensive research has enabled us to design a Coupling which not only balances alignment errors, but also permits free lateral float to the connected shafts, thus increasing enormously the life of connected machinery. A feature of these Couplings is their ability to transmit the full power of the connected machines with a smooth uniformity which guarantees the maximum efficiency. 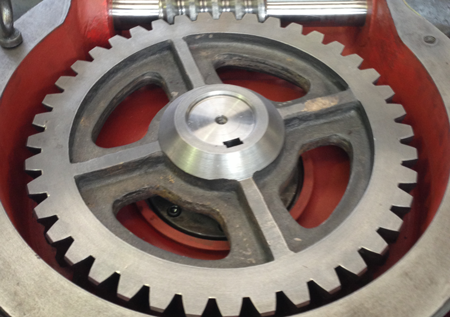 All shaft misalignments are taken care of without undue strain on shafts or bearings, and their ability to allow free endwise float to each shaft will be doubly appreciated by users of gear driven machinery. 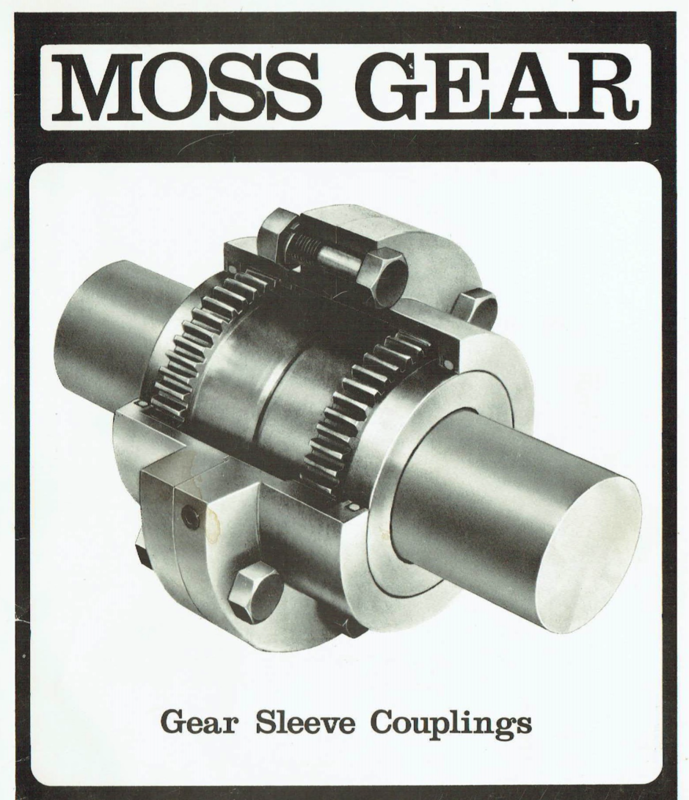 The shock of sudden reversals is adequately borne by these geared couplings without damage to themselves or the machines they connect. The Mark 5 Series of Couplings has been designed to transmit greater horse-power and increased maximum bore sizes than previously possible. The experience gained from previous Couplings has ensured that these Couplings will prove invaluable to all users of machinery employing connected or Coupled shafts. In the following diagrams exaggerated for clarity the easy way in which the Coupling automatically adjusts itself to take care of alignment errors will be appreciated. 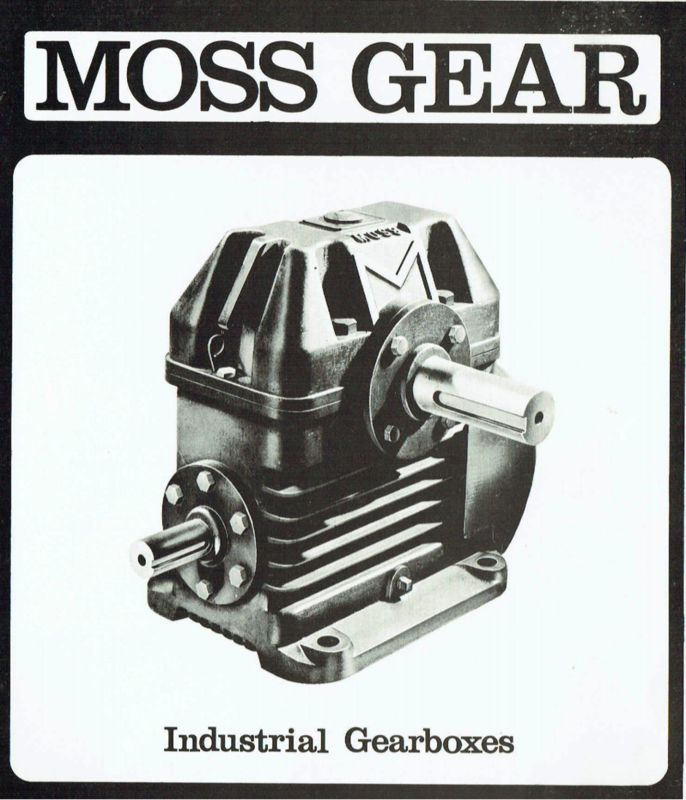 GENERAL Modern styling has been adopted for these new Fan-Cooled Worm Reduction Gear Units, and the external dimensions conform to British Standard 3027. The introduction of these new units with their increased ratings which have been achieved by a complete re-design, will often allow the use of a smaller unit for the same duty than would previously have been recommended. Standard ratios 9.66/1, 14.5/1, 19.5/1, 30/I, 40/I, and 50/1 are manufactured on a stock production basis, but the other ratios listed in this leaflet are available on demand. WORM The worm is made from high quality nickel case-hardening steel, and the worm threads are correctly cut, ground and super finished on the flanks. WORM WHEEL The Worm Wheel is manufactured in the form of a high quality phosphor bronze rim, securely fixed to a cast iron centre. The teeth are accurately hobbed by a generating process to ensure correct tooth contact with the mating worm. BEARINGS Ball and Roller Bearings are used throughout. 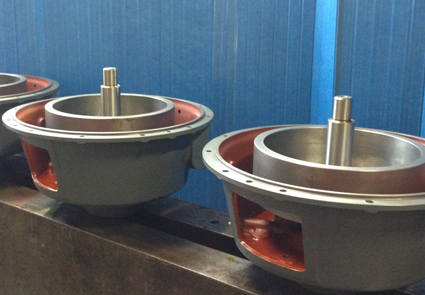 Combined thrust and journal bearings are used for both worm and wheel shafts, and a roller bearing is mounted on the wheel shaft to carry large overhung loads when required. Bearing journals and shaft extensions are ground to fine limits. GEAR CASE Close grained cast iron is used for the gear case. and. large cooling fins are cast integral along both sides and the underside. It is accurately machined in the bores and on the facings and is oiltight and dustproof. Great emphasis is placed on rigidity and the extensive external ribbings, in addition to providing increased cooling area, gives added stiffness. COOLING The high thermal efficiencies of the new ' MOSS ' Gear Unit are obtained by the improved fan design, giving increased distribution of cold air along the horizontal and vertical ribbing on the bottom half of the gear case, in conjunction with the maximum heat dissipation obtained by the increased surface area of the new design. LUBRICATION The worm shaft being partly submerged in oil carries sufficient lubricant to the wheel and worm shaft bearings. Lubrication to the wheel shaft bearings is provided by specially designed scrapers, collecting oil from the side of the wheel and returning it through special oil channels. EFFICIENCY High efficiency has been achieved by correct design. the careful selection of materials, efficient lubricant, coupled with precision methods of manufacture. Maximum normal temperature rise is 37.78°C (100°F) on which the ratings are based. RUNNING TEST All gear units are tested after final assembly under light load, up to full speeds. Every gear is care-fully checked for silence and oil tightness.